Just like rivers and glaciers, wind is an agent of erosion – meaning it transports loose sediments. Under these conditions wind is capable of transporting sediment in very dramatic fashion and we can see events like dust storms, dust devils, etc. 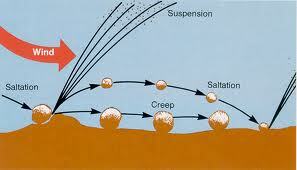 IN DRY AREAS WITH LOOSE SEDIMENT AND STRONG WINDS, IT IS POSSIBLE FOR THE WIND TO PICK UP AND CARRY SEDIMENT LONG DISTANCES. WHEN THESE SEDIMENT PARTICLES GET BLOWN AROUND BY THE WIND THEY SOMETIMES SMASH INTO OTHER ROCKS CAUSING ABRASION. Silt and clay particles are very soft and small, and usually cant wear away any rocks. SAND IS LARGER AND MADE OF QUARTZ, A HARD MINERAL, SO IT IS VERY EFFECTIVE AT WEARING AWAY ROCKY SURFACES. 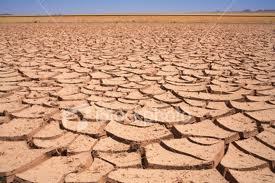 The erosive power of sand is used by humans to help clean paint off of buildings and concrete during sandblasting. In dry desert areas with lots of sand, and very few trees to block the wind, blowing sand wears away enough rock to create very unique features. 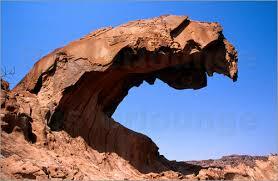 VENTIFACTS ARE ODDLY SHAPED ROCKS CARED AND GROUND DOWN BY SAND BLASTING INTO BOULDERS. THE WINDWARD SIDE BECOMES SMOOTH, FLAT, AND WORN AWAY. THE LEEWARD SIDE MAINTAINS ITS ORIGINAL SHAPE. ARCHES ARE EXACTLY WHAT THEY SOUND LIKE, A BIG ARCH MADE OF ROCK. They are carved by wind, as the hollow area in the middle is worn away faster than the outside area. BLOWOUTS ARE HOLLOW BASINS WHERE ALL SEDIMENT HAS BEEN ERODED AWAY FROM THE DESERT FLOOR, LEAVING A CRAKED FLAT SURFACE. DUNES ARE LOPSIDED HILLS OF SAND DEPOSITED BY WIND. THE WINDWARD SIDE HAS A GENTLE UPWARD SLOPE. THE LEEWARD SIDE HAS A STEEPER DROP OFF. Dunes form as the sand piles up against shrubs, boulders or other obstructions.If the wind is steady from one direction it creates a gentle slope on the windward side, and a shorter steeper slope on the leeward side. These dunes can range in size form a few meters high to more than 100 m high and 1000 of meters long. Dunes usually occur over large areas over 800,000km. Every time the wind blows up against the windward side of a sand dune, some of the surface sand is carried over the top, and it falls down on the leeward side. As this continues, the entire dune begins to move towards the leeward side, as fast as 30m / year. Migrating dunes can bury towns, farms, and forests.